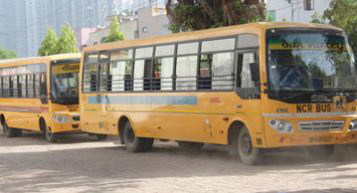 The school offers a fleet of buses that ply across the various pockets of NCR. The route details of which can be obtained from the transport department upon enquiry. Each school bus is appointed with a route in charge (teacher) who ensure discipline and safety is maintained at all time. Sun Valley International School has fleet of Buses that go to all the nearby areas like Vaishali, Vasundhara, Indirapuram and some areas of Ghaziabad and Delhi. The drivers and conductors are well trained and connected to each other and the School by Cell phones provided to them. For proper functioning every route is given two teachers and route registers are maintained where teachers take daily attendance of the route students. The buses leave the School only after the route teacher checks that each child who ought to be in on the bus has actually boarded the bus.